Have you ever been guilty of snapping angrily at someone when you were hungry? Research1 has identified exactly what causes the emotive response to hunger, commonly known to be 'hanger' – and what foods to eat to keep it at bay. In fact, science proves a diet rich in protein foods, such as eggs, minimises hunger2. This in turn will reduce rage and irritability. 'Hanger' is a term that refers to the phenomenon of feeling angry and short-tempered when hungry. As time passes after your last meal, the level of glucose in the blood drops. When blood glucose levels drop, the body naturally rebalances these levels to maintain energy between meals. When these levels remain low, the amount of fuel getting to the brain is not optimal and this can be enough to alter mood. For many, this means instinctively reaching for a high-sugar treat to satisfy cravings. The bad news is that this "quick fix" will ultimately leave sugar levels crashing even harder later on. Sharon Natoli, leading dietitian and author from Food & Nutrition Australia said, "It has long been known that food and mood are intrinsically linked. What and when we eat can have a direct effect on temperament. Eating regularly throughout the day and including protein rich foods at each meal, along with sufficient fibre, can help you to take control of your food intake, by helping you feel fuller for longer and stabilising energy levels that in turn help you maintain a good mood." A diet containing highly processed, fried and sugary food is directly linked to low mood and increases the chance of feeling down in the dumps by as much as 36 per cent3. Carbohydrate foods that are high in added sugar, such as cakes, biscuits and sweet snack bars, can contribute to irregular bursts of energy and unexpected mood swings. Research finds that eating healthy, nutrient rich and high protein foods, such as the humble egg, will keep you fuller for longer. This is linked to the fact that protein significantly impacts hormones that regulate appetite, signalling to the brain that no more food is needed. Eggs also contain the amino acid, tryptophan, which is converted to serotonin in the body, a brain chemical that can improve mood and help with relaxation, proving eggs really can be your happy pill. "Feeling 'hangry' means you'll be grumpy and irritable, so understanding your body and being well prepared with a variety of healthy foods to eat can help you avoid this situation. Simply adding a high protein option, such as an egg, to your meal, or as a snack, will fill you for longer and uphold your feel-good vibe. Eggs are a great option and incredibly versatile," Natoli continued. The best way to improve mood through diet is to eat foods that contain a variety of key nutrients and vitamins. 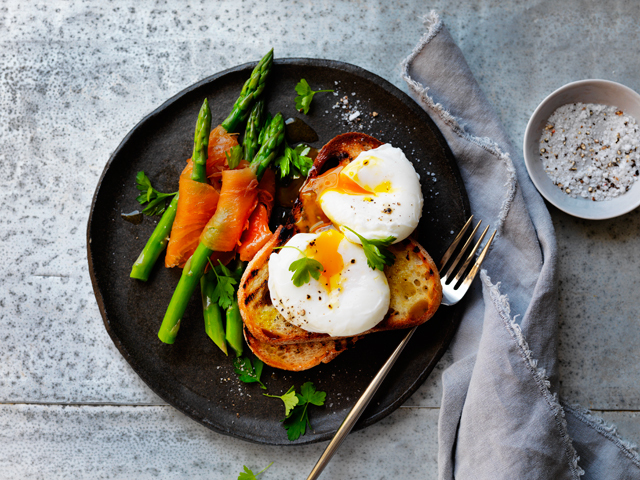 Eggs are a great 'good-mood' diet staple, containing 11 different vitamins and nutrients and can be eaten for breakfast, lunch, dinner or a snack.